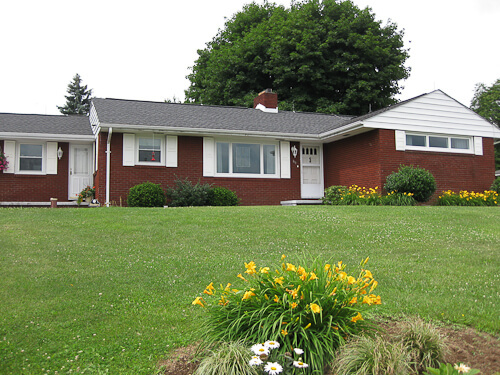 We didn’t start out looking for a mid-century home, but it fit all of our requirements. 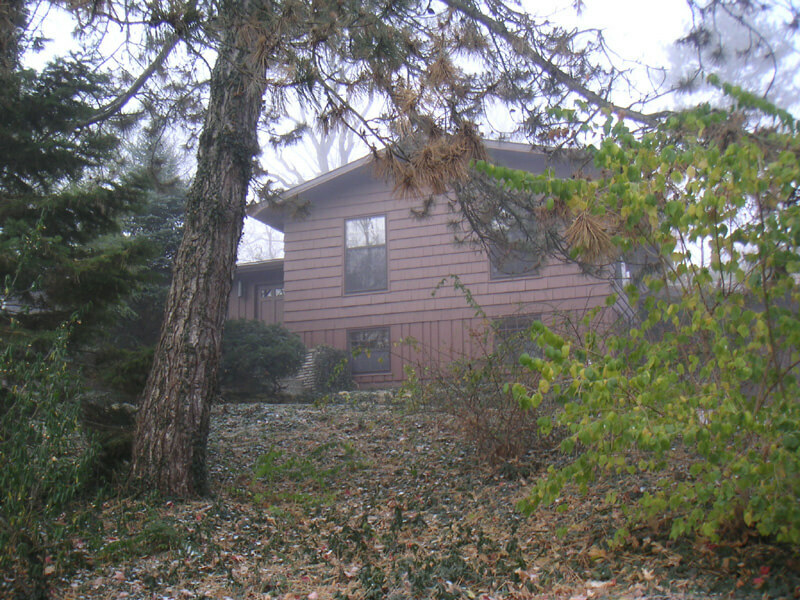 Our home was waiting for us just ½ mile from where our apartment was located and had been on the market for 18 months. Our little house on the hill. Built in 1956, as was most of the neighborhood. 1,500 sq. ft. feels just right.The house had not been care for over the past several years, and some poor decisions on “updates” needed to be addressed. At the top of the list was a major renovation on the bathroom, a minor renovation on the kitchen (major to come next year), paint entire interior, refinish hardwood floors, finish “man cave” in basement and a long list of other repairs. We have been amazed at all of the details that went into the design of this home. We have great built-ins in the hall way, bathroom, dining room and basement. They really utilized every inch of the space available. We were fortunate to have the original floor plans of this house. It was designed by Richard Pollman. It appears that Pollman designed many homes in the 50’s and 60’s. These plans were sold by Home Planners, Inc. out of Detroit. The header on the plans state “ Designs for Convenient Living”. Our plan was to attack the interior this year and then move on to the exterior next year. The floor plans show the original window box design as well as a very cool trellis. Can’t wait to jump on those projects, but first wanted to share with you some of our interior projects. Faux, Faux, Faux. What more can I say. Cultured Marble everywhere. The vanity and countertop took up too much space making it feel small. Nothing truly fit the style of the house and needed to go, and so it did. 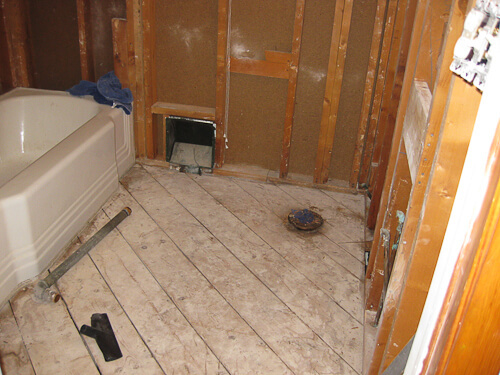 It was stripped down to the studs and sub floor. We found three layers of everything. The original wall tile had been removed, but we were able to see the height on the walls and where they had run an accent tile. We utilized this for our new tile layout. The only thing we saved in the bath was the original tub. 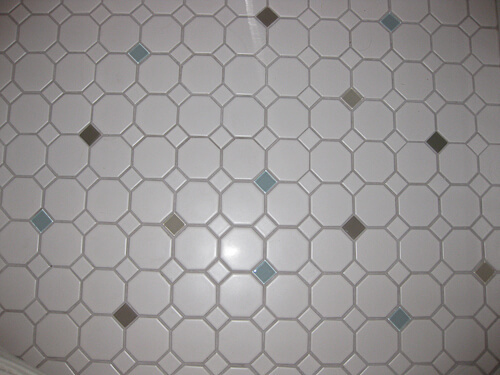 Tile selection and design was a tough decision. Your site was truly inspiring and I poured over many, many articles over many weeks. 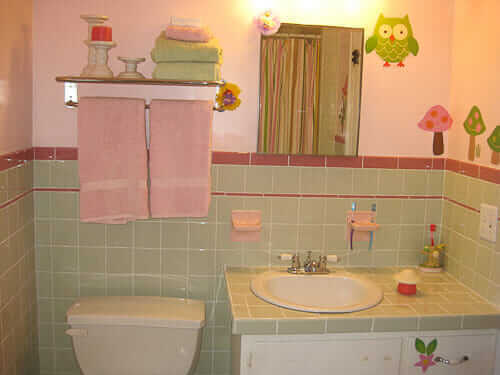 We knew that we wanted to have a bathroom that honored the style of the house. With the original floor plans in hand I designed a bath that honored this 1956 home. 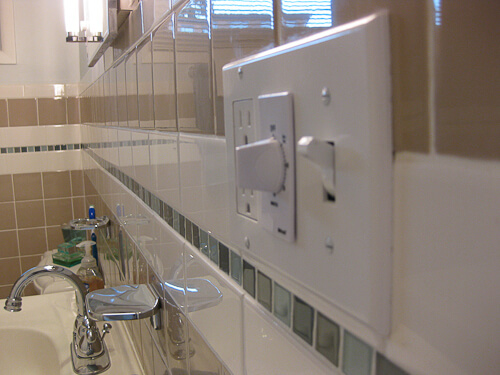 For the wall tile we used Taupe Mist 4″ x 4″, from Lowes along with white subway tile, bull nose and cove. 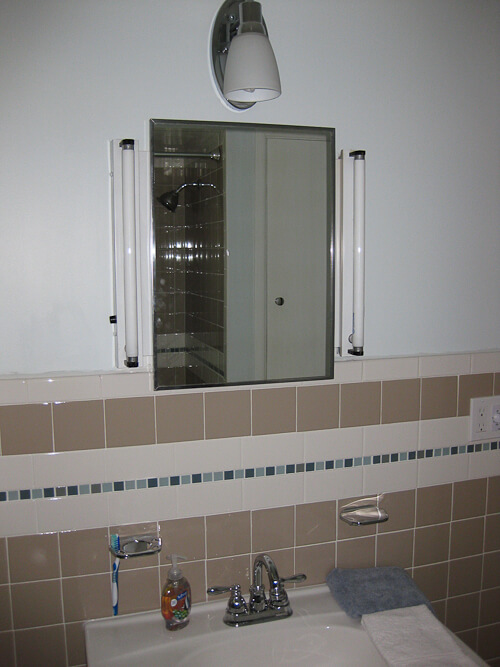 Ahhh… This bathroom makes me feel calm each time I enter..
Shower built-in niche by Tile Redi worked great! We added a timer for the fan based on the bathroom renovation of your mom’s bath and love it! 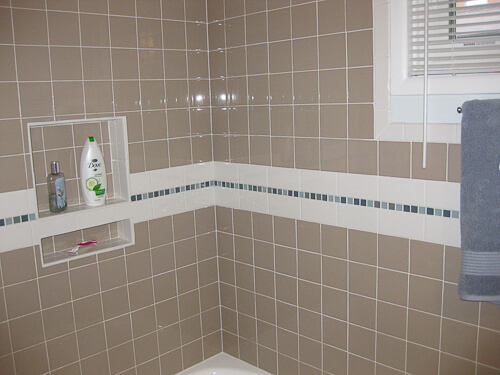 Glass tile accents came from a 12” X 12” sheet cut into strips, also from Lowes. All tiles were stock items from Lowes. For the floor, we popped out random white tiles from the all white sheets and added the glass tiles to coordinate with the accent strip in the wall tile. Grout for floor is taupe to match walls. Our sink was a real find in the back of a pick up truck in a parking lot. For $20 it was mine. New legs and faucet and it was good to go! I choose these legs because they were adjustable. My husband and I are both tall and others seemed too low for what we wanted. These are adjustable from 29 1/4″ to 31 5/8″. Source: MSC Industrial Supply Co. / MSCdirect.com / MCS Item # 37023892 /$66.84. 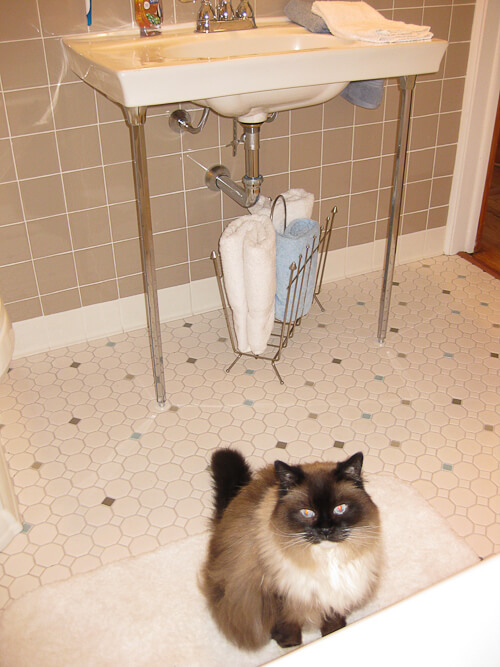 I also purchased my sink brackets from DEA Bath and they worked out great. I bought two of them and doubled them up to support the weight of this larger sink. We found the original medicine cabinet in the attic. I still need to order new light covers, but it all still works great! 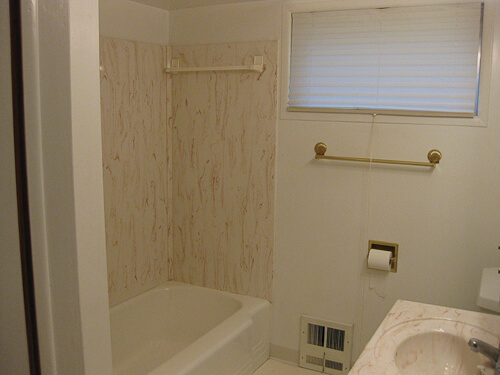 While we did not go with a Pink Bath, we are pleased that this bath fit’s the design of the home. 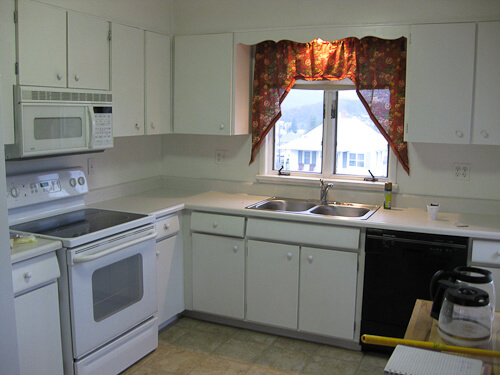 The kitchen was functional and the budget just did not allow for a major renovation at this time, so I decided that I would let color do the work for now. I repainted the kitchen cabinets, painted the walls and updated the hardware. New curtains pulled it all together. This is just a happy kitchen and I love it! 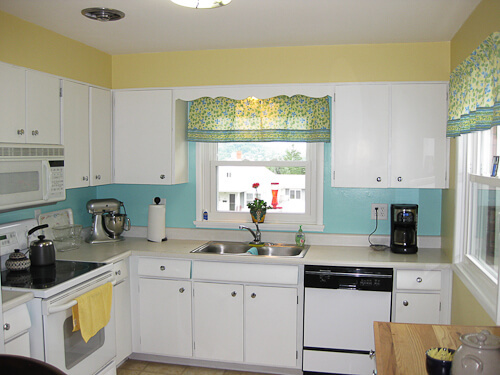 Sherwin Williams Sunbeam Yellow and Tame Teal paints gave new life to this plain kitchen. New knobs from Hickory Hardware gave some bling. Painting the sides of the drawers with the Tame Teal brought out the unique, curved drawer design. This is our built in china cabinet. 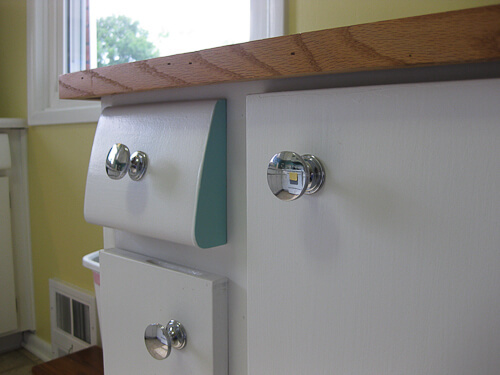 I painted the back Tame Teal, exterior white and added the same chrome knobs as the kitchen. Perfect home for my Franciscan dishes. The soup tureen on the second shelf was a wedding gift for my parents in 1958. So for under $150, I gave new life to this old kitchen with the original wood cabinets and I could not be happier with the results. In the future we will install new Formica counter tops. I am leaning towards Beluga Beige. Thoughts? For the floors – VCT. Color? We plan on replacing the appliances as needed. This is now my happy place. 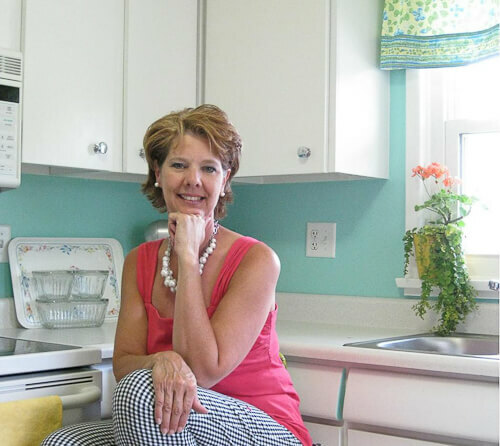 Love to sit at the counter, drink my coffee and catch up on what is new on Retro Renovation. Thanks for everyone’s postings, pictures, ideas and recourses. I love the house I am in! Thanks for listening! Make it a great day! Trina, you rock, girl! 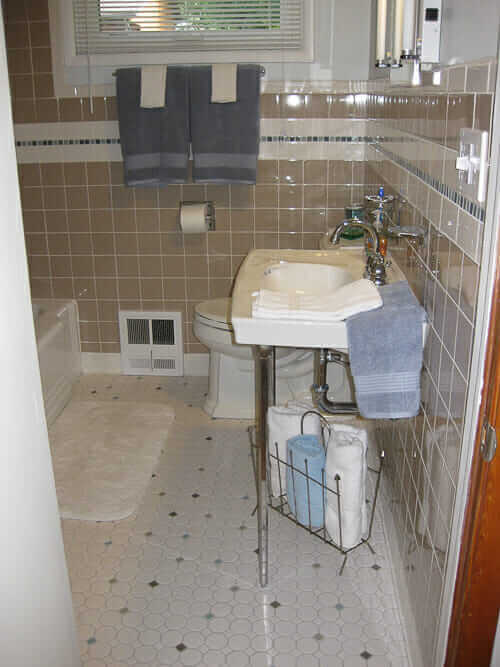 I am sure that your bathroom will provide lots of inspiration to other readers, so thank you so much for taking the time to chronicle your effort and all the resources you used. What goes around comes around, so you know we’ll be happy to help with any questions about next year’s kitchen renovation. In that regard, I am due for a big scan of current and new laminate options – so watch for an update soon. Honestly, it looks like you don’t need much help, you seem to have perfect instincts. 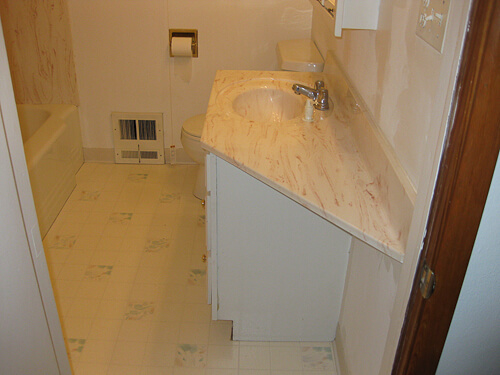 One of my bathrooms is the same color as yours, although at the time I bought the tile from Home Depot, the color was called Rose Beige. 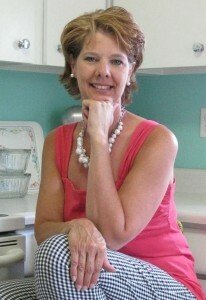 I find it very soothing and adaptable to accessorizing with blues and greens – as you have. 5 years later, and I’m happy to see others are embracing their old kitchens. I have been trying to preserve, and or restore my 1963 kitchen back to its formal glory – thankfully the cabinets have not ever been painting and are in near mint condition, (a stunning natural blond kind of tigers eye look with some retro accents – much like your curved drawers). However I cannot say the same for the hardware, sink and counter tops. Welcome, Jannett! Be sure to dive into all our categories — we have lots of resources researched for replacement hardware, sinks and countertops. Use the blue navigation at the top – it opens to orange subcategories. Good luck! 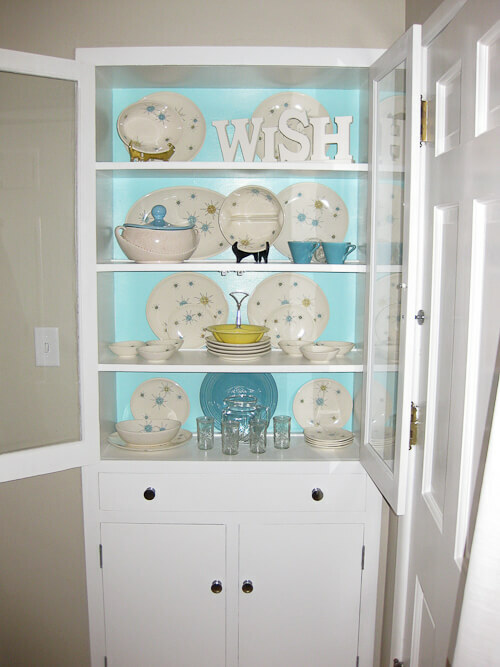 I was hit with a pang of nostalgia after seeing Trina’s China cabinet! 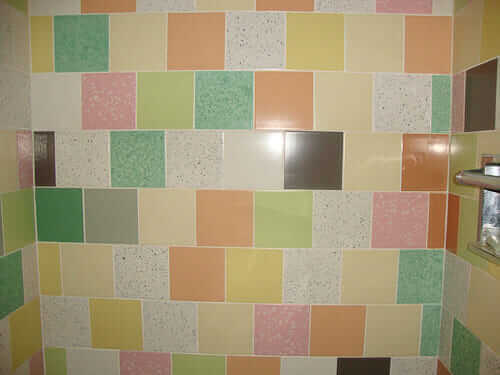 I grew up with that Franciscan pattern in the late 50’s – mid-60’s. So fun to see it!